AT his age, most people would expect former President Robert Mugabe to be suffering from a chronic loss of memory, but, like wine, he actually appears to be getting better. Just like his sharp memory, the humour that used to characterise his 37-year-rule has also defied all odds and the man is still capable of illuminating any event the same way he did years back when he was still the darling of most Zanu PF supporters. For the past nine months, Mugabe (94) has been isolated and casting a shadow of a bitter man after he was forced out of office in a soft coup last November. At the funeral wake of his mother-in-law, Idah Marufu, at his Borrowdale home last Thursday, Mugabe showed he had lost none of his demagoguery, going down the memory lane to narrate how his adulterous relationship with his current wife Grace started while his Ghanaian-born first wife, Sally was on her hospital bed battling with kidney failure. “My mother was always crying, saying she wished to see my child before passing on,” Mugabe said. “My wife Sally was ill and was bedridden, and at that time, I met this girl [pointing to Grace] at State House where she was a secretary. “Yes, we got involved when Sally was still alive, I had to. So she came as a secretary and they were many of them, I just looked at them and then it was love at first sight with Grace. He added: “Then one day I said to her, ‘I love you and she was numb. I then grabbed her hand and I kissed her. Grace looked taken aback by the narrative and buried her face in her palms as the veteran storyteller lifted the lid on their long-held secret. 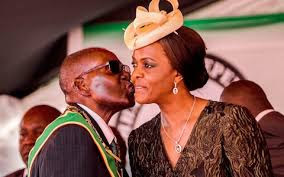 Mugabe said the two love birds used to secretly meet at his now late sister, Sabina’s house, while his nephews played messengers to keep the affair under wraps. Bona, their eldest daughter was born of the adulterous affair two years before Sally died in 1992 and Mugabe, a devout catholic said his mother’s wishes prevailed over his religious beliefs. Mugabe later officially married Grace in 1996 and they went on to have two more children, Robert Junior and Bellarmine Chatunga.